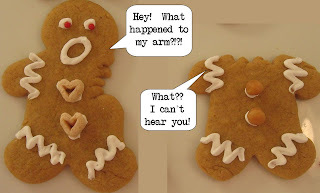 We may be a little morbid, but for some reason these cookies crack me up!! I actually have these cookie cutters by Fred, but I found that you can make silly gingerbread men easier (and cuter) but just using a knife to cut off a limb. While you're making Holiday treats, think about how funny these would be on top of your goodie plates. I know I'd laugh if I got some. Use our favorite gingerbread recipe below, or just buy a mix (Betty Crocker actually has a really tasty gingerbread cookie mix!). If you're like me, every year when you start your holiday cooking, you think: "Oh, I wish my kitchen had this or this". Well, how about a $5,000 kitchen makeover from Pillsbury?! 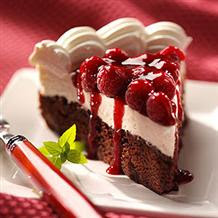 Pillsbury wants to hear how consumers make things sweeter with their favorite desserts at www.pillsburybaking.com/campaign. The sweetest entry will receive a kitchen makeover worth $5,000, and Pillsbury will also make a donation to Feeding AmericaTM to help end hunger in this country. You get a new kitchen and hungry people get fed. Awesome! Just this fall, brownies were voted America’s favorite dessert in the Pillsbury® Campaign for a Sweeter America, so they’re sure to be a crowd-pleaser at any holiday party. 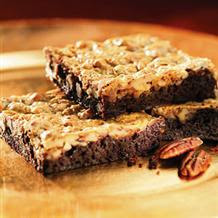 Here are some fun ways to make luscious desserts starting with a brownie mix. So easy and they're amazing!! "What great new flavors!!!! Yum Yum :-)"
As you know, with leaner economic times comes great creativity – especially in the kitchen. As the holiday entertaining season approaches, instead of hitting the bakery, consider baking at home! So help inspire kitchen creativity, Pillsbury is sending one Gourmet-Mom-on-the-Go reader a gift box with a brownie mix and both of Smuckers new limited edition toppings--Cherry Magic Shell, and Pumpkin Spice ice cream topping. YUM!! 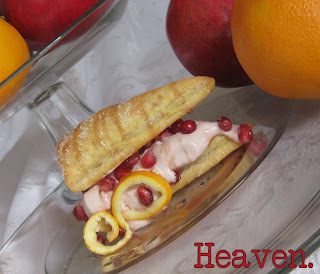 The girls and I made these up for dessert this afternoon, they're an easy sweet treat for Thanksgiving. Have fun! 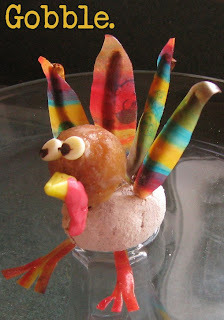 The pretzel sticks are the "glue" that holds this turkey together! 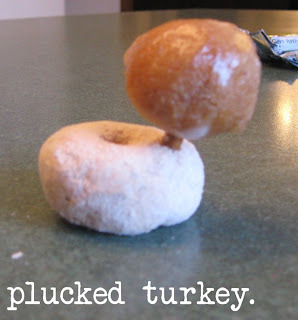 Snap a pretzel stick in half, put one end in the doughnut hole and the other end in the doughnut to form the turkey's body. Push two white chocolate chips, pointy-side down, into the doughnut hole to make the eyes. Cut a yellow starburst candy into four triangles (these will be the beaks). Place a red starburst candy in the microwave for about 5 seconds to soften it up. Pinch off a small piece to form the wattle and press it on the side of the beak. Take a small pretzel piece, poke it in one end of the beak and the other end in the doughnut hole. Give the kids each a pair of scissors and a fruit roll-up. 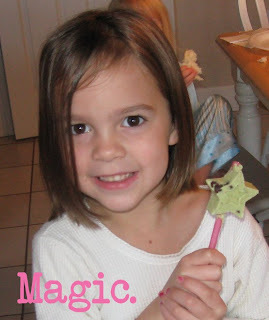 Let them cut out four feather shapes and two "legs" (cut a strip with two small snips at one end for feet). Press each "feather" against a pretzel stick then push it into the mini-doughnut. Add the feet. Using a toothpick or chopstick, place a small amount of chocolate frosting or melted chocolate chips on each eye to form the pupil. Watch them get gobbled up! Happy Birthday Little C!! 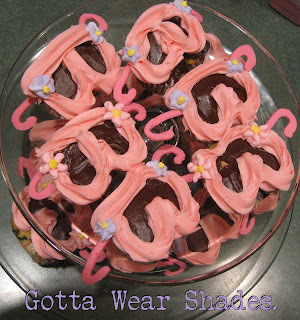 She must think her mom is a magician because she wanted "sunglasses cupcakes" for her Beach Birthday Party. Say what?! I decided to take the challenge. Well, these turned out pretty cute even though they look a lot more like fancy "Letter B's." to me. :) They'd probably work better if you made them with two circular cupcakes. Oh well, they were still gobbled up! There was snow on the ground but a rockin' Beach Party going on in our house! All the girls wore swimsuits, Gourmet Dad and I dressed as lifeguards and a good time was had by all. Preheat oven to 350 degrees. Put cupcake liners in muffin pan. Fill liners with 1/4 c. batter. Take a piece of aluminum foil (about 6" square) and roll and squish into an oval shape. Push the foil oval into the side of the cupcake liner. Repeat with all the cupcakes. Bake at 350 for 15-18 minutes. Remove from oven and cool completely. On a piece of was paper, pipe out candy cane shapes with melted Candy Melts (put melted candy in a quart ziploc freezer bag, snip off a corner, and you can easily pipe out shapes). These will be the sides of your sunglasses. Let set until completely hardened. Frost cupcake with a thin layer of chocolate frosting. Put colored frosting in a decorating bag or a ziploc bag w/ the end cut off and pipe out the sunglasses outline. Add any sprinkles or garnishes you want. Add two dried "candy cane" shapes for the sides of the sunglasses. I got some great cooking/entertaining/parent advice today! I just had he coolest phone conversation ever (not counting any time hunky Gourmet Dad is on the phone;)). I was on a conference call with the amazingly talented Wolfgang Puck and two other bloggers this morning (Jenny from Picky Palate and Holly from PheMomenon). I have no idea how I got so lucky, I am definitely no gourmet chef, so I'm glad I got to join in on the fun! I had doubts I was really going to get to talk to him, but we all chatted for almost half an hour! I didn't know Wolfgang Puck's children are so spread out: ages 3 to 19! He's definitely been around the block when it comes to feeding your kids. First and foremost, he said that you should never differenciate between "kids food" and "adult food". He said just serve them what you eat and they'll grow to like it. Don't waste your time and energy making 2 dinners every day! He takes his children with him every weekend to the local Farmers Market. He said they eat their way around the market, everything from goat cheese to fresh fruits and veggies. A favorite Sunday morning recipe is simply using a box of pancake mix and instead of milk, add a yogurt for flavor and cook the children small pancakes. He said it's one of their favorites! He also said that even though kids might reject a food the first (or 8 times) it's introduced to them, if they see you eating it, they'll eventually try it and usually like it. "Ordinary" food becomes special when you serve it in small pieces. 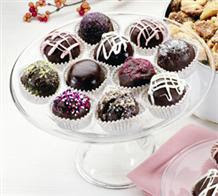 Make an appetizer buffet with small brownie bites (maybe drizzled with chocolate or caramel sauce). You can make spring rolls, fried shrimp (or buy them ready-made) served with different sauces. Cheese plates are always enjoyed, he mentioned that you can get a lot of really good international kinds at Sams Club. Then, he recommended making little signs with the name and country of origin of each cheese. This is also a great way to tie in an eclectic mix of food (have a variety of appetizers and "cheeses around the world"). If you serve wine, he recommends several kinds throughout the evening to get conversations started. He said that creating recipes and dishes is like being an artist, you go through different phases and are inspired by many things. He said that his culinary art has definitely evolved and gone through different creative periods. He mentioned several of his restaurants and how we was always trying to create something new and different. He said it's hard to feed the masses or to have an "inexpensive" restaurant because he always wants to buy the very best ingredients available (which we all know, especially now, are not cheap!) I had never thought of that. Here's some more information on Sam’s Club®'s sixth annual “Holiday Taste of Sam’s Club”. It's 10:30 a.m. – 6 p.m., Friday, Nov. 21, through Sunday, Nov. 23, in 598 Sam’s Club locations nationwide. You don't have to be a member to attend, and if you've never gone, it's a GREAT way to try some fabulous food for free! With samples like mini-beef wellingtons, quesadilla trumpets, cheesecake, jumbo shrimp, stuffed turkey breast and much more, Holiday Taste of Sam’s Club truly is the ultimate demo event. We'll be there! THANK YOU, Wolfgang Puck and Sams Club, for answering our questions and being so gracious. It was definitely a once-in-a-lifetime experience for me and I got some great advice I'll definitely be using!! 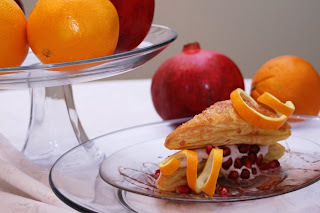 Did you know that Pomegranates have almost 3 times more antioxidants than red wine? A recent study also showed that Pomegranate juice was found to have the highest polyphenol content of any beverage, even outcompeting recent "superfoods" such as acai berry or green and white tea. Very cool. 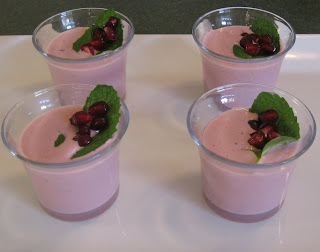 So, I came up with this luscious dessert for any occasion that you can also feel good about! 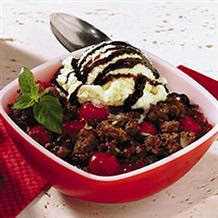 This is so easy to prepare (20-30 minutes) and it's a "sure-to-impress" dessert. I also included options for cutting the fat and calories that will make each serving under 300 calories! Preheat oven to 400 degrees. Mix Honey and 2 T. Pomegranate juice well with a wire whisk. Keep refrigerated until ready to use. Place thawed puff pastry dough on a cutting board and cut into 6 rectangles. Slice each rectangle diagonally to form two triangles. (See video tutorial). 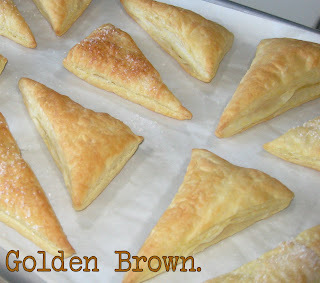 Set triangles on a baking sheet covered in parchment. Sprinkle coarse sugar on six of the triangles. These will be the tops of your dessert. Bake at 400 degrees for 11-14 minutes until golden brown. Remove from oven and let cool. 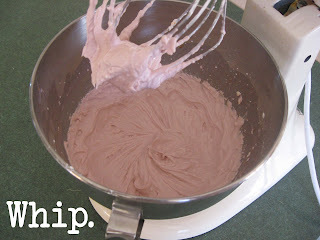 While pastries are baking, whip cream cheese for 30 seconds on high speed in a medium mixing bowl. 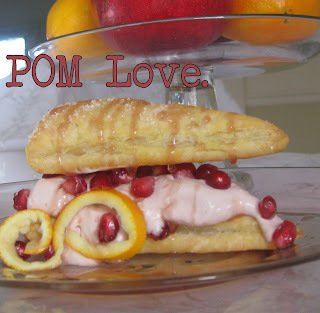 Reduce speed to low and add POM Wonderful Pomegranate Juice, orange zest and almond extract. Mix well. Add powdered sugar and beat until fluffy. Set aside. 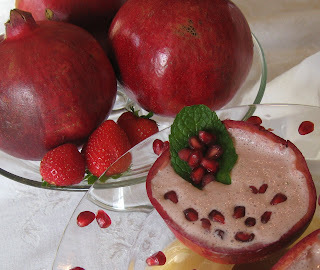 Simply cut the ends off the Pomegranate, make 4 score marks into the flesh, cutting until you reach the white pulp, and submerge the entire fruit in a bowl of cool water. Working under the water, pull apart the fruit into 4 sections and separate the arils from the white pulp. The arils will sink and the pulp will float to the top where you can strain it off. When finished, strain the arils and they’re ready to use! Note: A huge THANK YOU to my uber-fabulous friend, Annie, and her mad photo skillz for the luscious photo at the top of the post. You are the best! If you're going to have a Tinkerbell Movie Night, of course you must decorate a home for your favorite fairy! These look hard, but they're really not. Just think gingerbread houses, but 3-sided. Let's do it! Any candies you want to decorate the houses. Clean out the pantry! 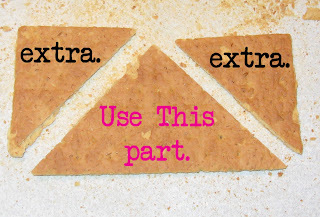 Cut the corners off three graham crackers to make a large triangle (see picture). Use the large triange and the two corners will be extra (crush them for a pie crust or something:)). Using royal icing, glue the triangles together to form a pyramid shape. This is the roof. NOTE: You do not need any fancy decorating bags, just put the icing in a ziploc freezer bag, snip off one corner, and pipe out the frosting. Roll out sugar cookie dough into 1/4" thickness and cut out 3 large rectangles. Use a whole graham cracker as a size guide. Place on a cookie sheet covered in aluminum foil & sprayed with cooking spray and cut out any shapes you want to make "windows" (see video tutorial). Put Life Saver candies in a large ziploc bag and crush them with a mallot or rolling pin. Using a small spoon, put crushed candies into the "windows" in your cookie rectangles. Bake at 375 for abuot 9 minutes until candies are melted and cookies are barely brown. Remove from oven and let cool. Take three rectangle cookies, place them on one of the smaller sides and glue together on one of the house bases. Pipe frosting on the top edge of your house and place a roof on top. Tint some icing green and have fun piping out vines and leaves on your house. Let dry (about an hour). Give your child a bag of icing (ziploc bag w/ a corner snipped off), some candies, and let them make this Tinkerbell House a "Home". Enjoy! I've had lots of people asking if they could post or share my recipes. Please, go ahead! I love that you're sharing them! Just make sure to link back to me. Enjoy your Monday, I'll have the Tinkerbell Houses up tonight!! "The lavender soap looks TO DIE FOR!!! That is probably my favorite, followed closely by patchouli!". Email me your contact info and I'll pass it on to the Sisters'! Congrats! The Tinkerbell House tutorial is coming, I promise! I'm just trying to type it all up. 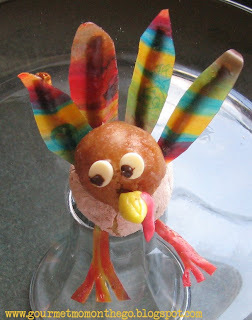 In the meantime, need something fun and easy for the kids to do to help with Thanksgiving Dinner (or any nice dinner)? How about fancy salad rings? This is a super cute and fancy way to present individual salads on a plate. We made these for a dinner we had tonight. After finishing them, I realized how "Christmas-y" they look--we'll be definitely be serving them at Holiday dinners! Make sure needle is clean by boiling it in water for a minute or two. Dry and thread a 12" piece of dental floss on it. I like to use large upholstery needles because they are easy for my children to handle and not especially sharp. 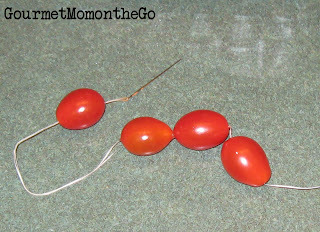 Let your child thread 6 or 7 cherry tomatoes on a string. 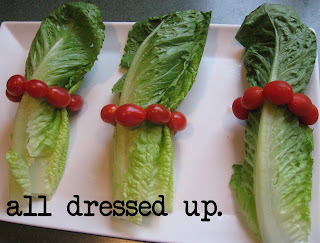 Wrap around several pieces of lettuce and tie in a knot (see video tutorial). Trim any excess string. Viola! Fancy salad rings. I just saw that I'm the featured blogger of the day on The Secret is in the Sauce. I looooooove SITS, how cool is that??!! 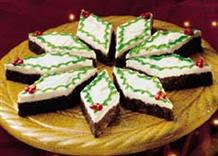 How great would these look with red & green sugar garnishing a Holiday plate!? I'll definitely do them during Christmas. Preheat oven to 400 degrees. Seperate biscuits and cut 5 triangular notches in each to resemble a flower (see quick video tutorial--excuse the messy kitchen, we were in full party mode!). Take two of the triangles you just cut out and roll into a ball. Coat one side of the "flower" in colored sugar and place on greased baking sheet. 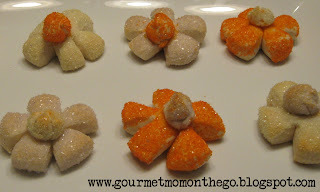 Roll the ball in another color sugar and place on top of the flower. Repeat with remaining biscuits. Bake at 400 for 7-9 minutes and serve. 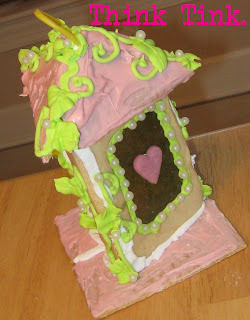 We also made edible Tinkerbell Houses, I'll post instructions tomorrow! Happy Friday! THEN, I found out that I can only ask one question. ONE QUESTION??! HOW ABOUT A MILLION?!!!! So, I need your help. 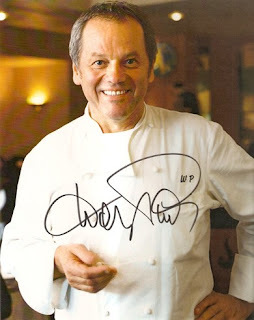 What one question would you ask Wolfgang Puck about Holiday entertaining and cooking? We have one shot to turn ourselves into chefs and entertainers extraordaire! Help me! I love to entertain large groups of people, but I really like to serve elegant and well-presented food. It's often hard to make a special dish or garnish for a large group. What ideas do you have for elegant food for a crowd? I haven't made these in years and have forgotten how fun and easy they are. Yesterday, Tracy sent me an email with these adorable pretzel squares (yummy, cute, and easy...very cool!) 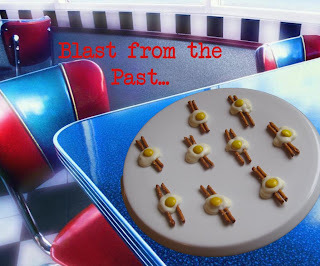 and they reminded me of those eggs & bacon treats I really enjoyed making as a kid. So, of course we had to whip up a batch. My girls got all giggly when they put the M & M's on and realized they really do look like "eggs"! If you need a fun treat in under 5 minutes, this is a great go-to idea. Lay out a sheet of wax paper on countertop. Lay 2 pretzel sticks side by side on wax paper. Put a small blob (about a teaspoon) of melted white chocolate in center to hold pretzels together and form the "egg white". 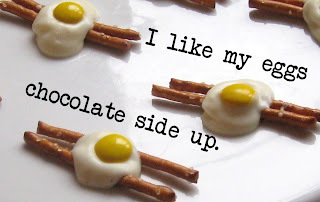 Place a yellow M&M in center of chocolate for yolk. Let harden at room temperature, then peel off and eat. You can store them in an airtight container for up to a week. We used to be all about Pink, but now we're all about Tink and all things Green! 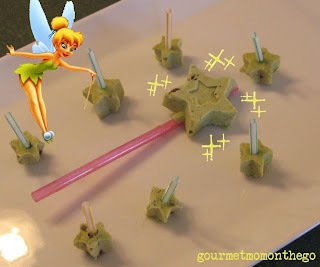 So, I'm in the kitchen creating some Tinkerbell fun (I figured I could use her picture since I don't sell anything on here:)). You don't need any special tools, you can use any ice cube mold or a mini-muffin pan. 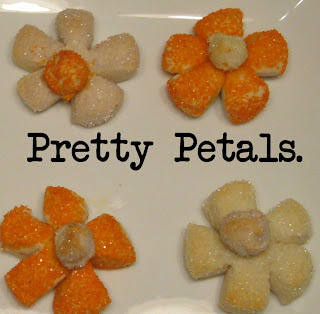 Don't be fooled by these little treats--they're made of peas! I was seriously skeptical, I must admit, but my kids ate them ALL in one sitting! They taste like mint chocolate chip ice cream! These Minty Pea Pops are from the Toddler Cafe, Jennifer is a genius at fun, tasty, and healthy food for kids. Who knew that peas could be so de-licious?! I happen to have these fun star molds from Fred. 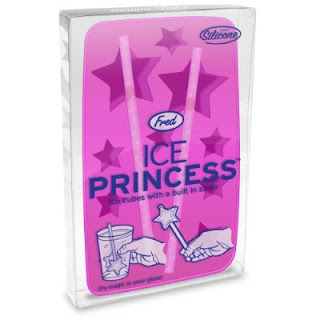 (You can also grab star-shaped ice cube molds at the dollar store in the summertime). But, like I said above, you don't need a special ice cube tray, and regular one will do or you can use a mini-muffin tin. Have ready 6 to 8 popsicle or wooden craft sticks or straws (I used straws cut into 3 pieces eacy) and a clean ice cube tray or mini muffin pan. 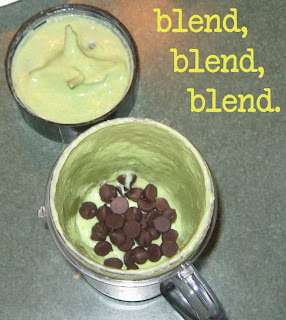 Combine the cream cheese, peas and sugar in a food processor or blender. Pulse/puree until smooth. Scrape down the sides as needed and add the peppermint extract; pulse or puree to mix well. Add the mini chocolate morsels by hand, stirring to combine. Transfer the mixture to a resealable plastic food storage bag; cut off 1/2 inch from a bottom corner of the bag and squeeze the mixture into the wells of the ice cube tray or muffin pan. Insert a popsicle/wooden stick into the center of each. Freeze the tray/pan for at least 3 hours or until firm (it actually works best if you let them freeze overnight). When the pops are frozen, remove them from the molds and freeze in an airtight container for up to 1 month.